liturgical time: walking the seasons: 2012 Pre-Christmas Veil Giveaway! Congrats to the winners: Brandon L. and Gina! It's time for the Liturgical Time Pre-Christmas veil giveaway! The consensus seems to be that y'all would like to see an Eternity Veil as the giveaway prize. Problem is, I can't decide on a color, so I'm going to offer the choice of purple, ivory, midnight blue, or mocha chocolate. Click on the picture for more photos. Three entries are possible. Please leave a separate comment for each entry. Comments can be made anonymously, but please leave a first name and last initial. One comment must contain an email address so that we can contact you if you win. If you do not want the email address published, just let us know in the comment. On request, we will create a substitute public entry for you, to protect the email address from publication. We will not keep these email addresses after the contest and we will never use them for marketing. You have our word on that. 3) For an optional additional entry: You, or someone else, must share this giveaway on Facebook, Twitter, a blog, or other social media. Please include a link to the share in your entry comment. Please remember: Leave a separate comment for each entry. The winner will be randomly selected and announced on this blog on December 15, 2012. Visit the shop for Christmas gift ideas! had my wife share on her blog friend feed. i would choose the double loop style. - gary f.
I think double loop; it looks more like something that my girlfriend would wear.... though in her book, more lace is always better! Kevin O. Although head coverings aren't very common in the United States, I teach English to international students, many of whom come from predominantly Muslim countries like Saudi Arabia, Turkey, Libya, Kuwait, and so on. The women usually wear some sort of head covering. I admire the fact that they do so even though it's not normal in American culture—it shows some measure of sober reflection and bravery, I think, to not adapt to American dress despite being surrounded by Americans. So to me, wearing a head covering in a public setting reflects some kind of conscious measure to step outside of secular American culture. I love a reverent liturgy and dress helps to achieve that end. I do notice chapel veils and I like them. The wearers are also dressed modestly which only adds to the prayerfulness. This is the first that I've seen the Eternity veil. They can be tied or looped in attractive ways. 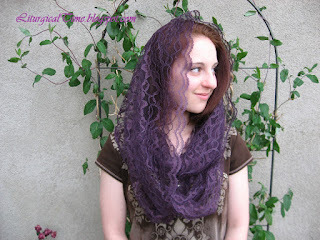 I especially like a beautiful smile to go along with the head covering. Welcome! We love to hear from you. You are embraced here in Christian charity.Your comment will not show up immediately. Rest assured that is has been received and will be published soon. Subscribe to receive tutorials, hints, reflections, and Veil Shop special offers from Liturgical Time. Let Us Keep the Feast! Support and reflections for those experiencing infertility or the aftermath of miscarriage. All original written and photographic material on this site copyright © 2011-2013 Liturgical Time. Liturgical Time is a participant in the Upromise, Reading Eggs, Shabby Apple, Dayspring, Deborah & Co, and other Associate programs, affiliate advertising programs designed to provide a means for sites to earn advertising fees by advertising and linking to shabbyapple.com, upromise.com readingeggs.com, dayspring.com, and others. All original written and photographic material on this site copyright © 2011-13 Liturgical Time.. Simple theme. Powered by Blogger.